Organisations are constantly seeking to get ahead of their competition, and for many, this means developing their in-house bid writing expertise. The ability to write a strong and competitive bid is a highly specialised skill which can have very lucrative results. Therefore, those tasked with writing bids must receive the very best training, to secure the most advantageous outcomes. By simply doing a quick internet search, it is clear that there are a plethora of options for those seeking bid writing training. So what makes Thornton & Lowe’s Bid Writing Workshops different from the others? 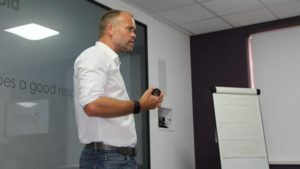 Our courses are delivered by Charles Grosstephan, who has been involved in well over a 1000 bids we have worked on; who has delivered nearly 200 training workshops around the country to nearly 2000 delegates. Our Bid Writing Workshops are delivered in a highly interactive way. We not only tell you what to do to, but crucially, how to actually do it. We focus on how to write a bid and successfully develop content. Delegates receive practical, hands-on, relevant information, packed with constructive tips and feedback, with ample time to have questions answered by someone who is highly experienced in actually writing winning bids. Our courses have been developed around industry best practise, input from procurement teams, and our years of knowledge and experience as bid writers in over 125 sectors ourselves. We offer a variety of courses, from an Introduction to Bidding course, to our one-day Bid Writing Workshop or our two-day Bid/Tender Masterclass, amongst others. Whatever level of experience and knowledge a delegate has, there is a course relevant to their requirements. Our courses earn delegates CPD points, for which a certificate is received. So what have delegates said about our courses? What Training options do Thornton & Lowe offer? From Introduction to Bidding courses to a 2-day Bid/Tender Masterclass, the CPD-accredited courses offered by Thornton & Lowe cover all aspects of preparation, planning and writing for those wishing to keep the development of their bids in-house. In addition, Thornton & Lowe offer industry-specific courses and bespoke in-house bid writing training courses, developed exactly to client requirements. Training is open to anyone within an organisation looking to improve company success rates, with some courses designed for beginners and some designed for those with more experience. To discuss your requirements, please email training@thorntonandlowe.com or call 01204 238046.